This volume of LNICST is a collection of the papers of the 4th International Conference on Bio-Inspired Models of Network, Information, and Computing Systems (Bionetics). The event took place in the medieval city of Avignon, known also as the City of the Popes, during December 9 to 11, 2009. 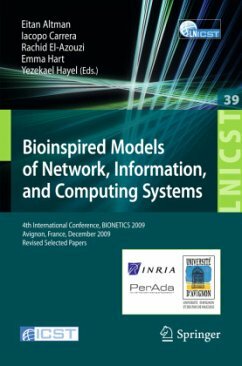 Bionetics main objective is to bring b- inspired paradigms into computer engineereing and networking, and to enhance the fruitful interactions between these fields and biology. The program of the conference indeed includes applications of various paradigms that have their origin in biology: population dynamics, branching processes, ant c- ony optimization. The proceedings include 19 papers covering a broad range of - portant issues in areas related to bio-inspired technologies. They correspond to pr- entations at 6 technical sessions. Four papers correspond to an invited session on the Epidemic-type forwarding in DTNs (sparse mobile ad-hoc wireless networks) org- ized by Dr Francesco De Pellegrini, (Italy, CREATE-NET). The following 9 papers (selected out of 15 submissions) correspond to contributions to regular sessions on Bio-inspired security, Bio-Inspired Networking, Bioinspired algorithms and software systems. The remaining 6 papers (selected out of a total of 9 submissions) are de- cated to work in progress. For each paper, we have provided at least two independent reviews, most of which were offered by members of the TPC. Regular Session 1: Bio-inspired Security.- Cooperation in Hunting and Food-Sharing: A Two-Player Bio-inspired Trust Model.- Executable Specification of Cryptofraglets in Maude for Security Verification.- Regular Session 2: Bio-inspired Networking.- Ensuring Fast Adaptation in an Ant-Based Path Management System.- iNet-EGT: An Evolutionarily Stable Adaptation Framework for Network Applications.- Situated Service Oriented Messaging for Opportunistic Networks.- Simulation and Implementation of the Autonomic Service Mobility Framework.- Work in Progress Session 1.- BIONETS Economics and Business Simulation: An Alternative Approach to Quantifying the Added Value for Distributed Mobile Communications and Exchanges.- BIONETS: Self Evolving Services in Opportunistic Networking Environments.- Activation-Inhibition-Based Data Highways for Wireless Sensor Networks.- Regular Session 3: Epidemic-Style Forwarding in DTNs.- Minimum Expected -Cast Time in DTNs.- Applying Branching Processes to Delay-Tolerant Networks.- Routing in Quasi-deterministic Intermittently Connected Networks.- Characteristics of the Dynamic of Mobile Networks.- Regular Session 4: Bio-inspired Algorithms and Software Systems.- ONTO-RUP: A RUP Based Approach for Developing Ontogenetic Software Systems.- Embryonic Models for Self-healing Distributed Services.- Bio-inspired Speed Detection and Discrimination.- Work in Progress Session 2.- Analytical Framework for Contact Time Evaluation in Delay-Tolerant Networks.- A Formal Approach for a Self Organizing Protocol Inspired by Bacteria Colonies: Production System Application.- Delay Tolerant Networks in Partially Overlapped Networks: A Non-cooperative Game Approach.